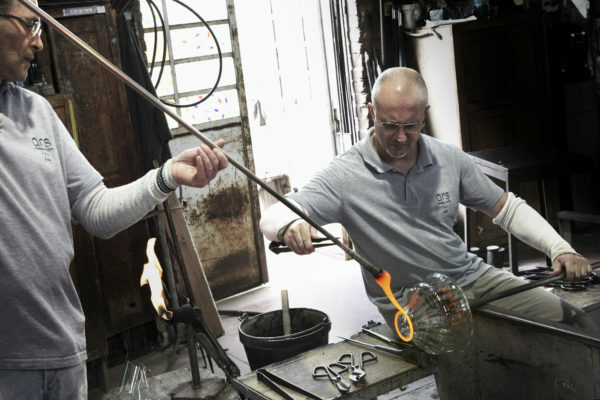 The secret of Murano glass lies in the craftsmanship of its production. A craftsmanship faithful to an almost millennial tradition handed down from generation to generation, treasuring the wisdom of the past and experimenting with new techniques for the future. Why is important to understand the difference? Hand-crafted glass shows significant differences from its large-scale industrial version. The individual processing of each single hand-made item requires working methods completely different from the industrial ones: these can be traced back to three fundamental differences. Hand-craftmanship involves the possibility of modeling the artistic item comprehensively, in a 360-degree process: for this very reason, the glass master will need more time and steps to shape its objects compared to automated industry, involving also greater commitment in terms of fatigue and corrections applied to refine the items while they are being created. Murano glass colors range in a large variety of hues and shades, as each glass factory traditionally holds its own particular “recipe” of raw materials to combine in order to get a specific color. The knowledge of glass-masters is passed from generation to generation, to young apprentices who develop in turn different techniques and specialize in specific processings of craft production. In this way, artistic objects are created, each of them containing centuries-old know-how, and unique characteristics at the same time. After centuries of theoretical and practical studies, as a result of countless attempts and slow conquests, Murano glass-masters have succeeded, through the development of a particular chemical structure and of tools specifically devised to facilitate their work, to obtain the greater malleability of Murano glass. Origianl Murano glass is characterized by the presence of greater quantities of carbonates and nitrates, such as sodium and potassium carbonate: these chemical elements allow for the glass to melt at lower temperatures and – most importantly- to solidify slowly, giving the glass-master more time to shape his objects. For these same reasons, Murano glass does not contain relevant percentages of lead, as this mineral would turn the glass too rigid (and therefore less malleable) for hand-blowing and -shaping. On the contrary, leaded glass is widely used in industrial glass-factories to obtain the typical gloss and transparency associated to machine-made or machine-assisted glass. The wide range of colors achievable with Murano glass is the result of empirical and theoretical studies carried over the centuries and jealously guarded — very unlike industrial colors that, often protected by official patents, become a common knowledge. In addition, colors such as yellow, ruby and red are particularly hard to obtain, due to the (minimum) deployment of cadmium: for instance, by modifying the percentage of minerals used and the processing time, different shades will result. This peculiarity makes original Murano glass even more unique, since each object is characterized by hues that may be exclusive and not always perfectly replicable. Why are we so proud of our products? In Ars Cenedese Murano we love the shapes and colors of our products, the numberless possibilities that only Murano glass malleability allows to explore – and, why not, the challanges we sometimes have to face and resolve – , and the heat radiating from our always active ovens. since 1946 we have specialized in the production and sale of artistic Murano glass, realizing every single product according to tradition and, at the same time, creating an iconic and up-to-date design. so many hours spent in glass-making are the guarantee of high-quality products, handled with care in every single working phase. we make it with passion!